Have you noticed the beautiful Painted Lady Butterfly flitting about your garden, in the meadows, along roadways, and even at the beach? I think we are having a Painted Lady irruption. The wave of Painted Ladies began appearing in large numbers this past spring, with reports of a dramatic increase in sightings in the midwest. The Painted Lady is the most successful butterfly in the world. It lives some part of the year on every continent except South America, where it is rare or absent. Despite the fact that the Painted Lady is the most widely distributed butterfly, not a great deal is known about its migration. In North America the annual spring migration is thought to originate in the northwestern region of Mexico, where they can be found all year round. Heavy rains in late winter in that region trigger an explosion of northward migrating Painted Ladies that establish the spring brood. I watched this little torn and tattered Painted Lady fly south over the Essex River, from Crane’s Beach to Wingaersheek Beach. She rested briefly on a rock before heading to the wildflowers in the dunes. 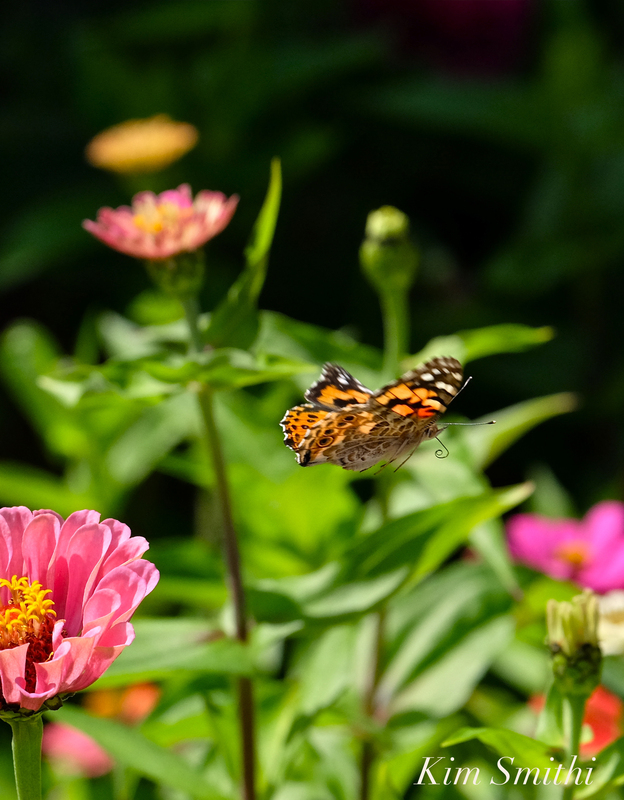 This entry was posted in Butterflies of Cape Ann, Butterflies of Massachusetts, Butterflies of New England, Butterfly Garden, Cambridge MA, Cape Ann Wildlife, Creating a Butterfly Garden, Gloucester, Lepidoptera ~ Butterflies, Skippers, and Moths, Life at the Edge of the Sea and tagged Flowers of the Dead, Mexican marigolds, Painted Lady migration, Paited Lady, tagete, Vanessa virginiensis, Zinnias on August 6, 2017 by Kim Smith. Last night I gave a talk on Fragrant Gardening at a sportmen’s club in Plymouth. In looking through images to update my presentation, I found two photos that had previously been overlooked. 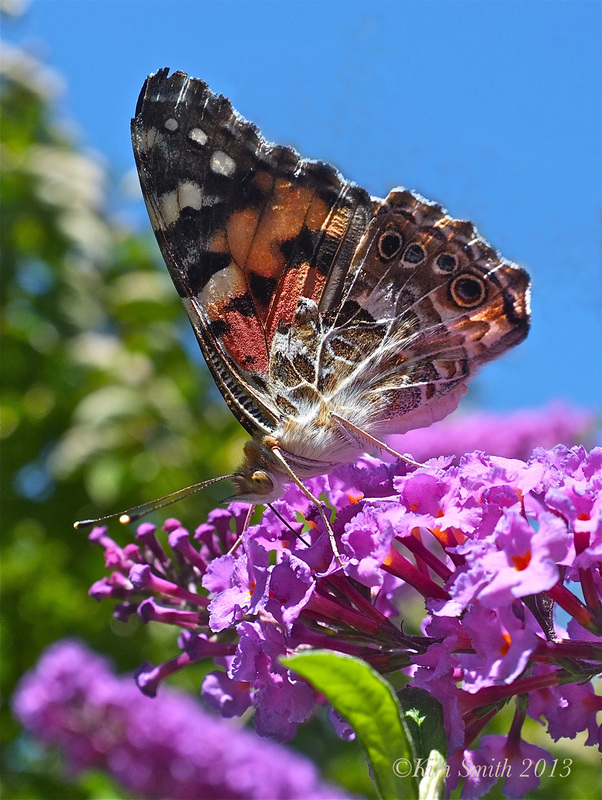 The first photo is of a Painted Lady nectaring at the sweetly scented butterfly bush ‘Nanho Purple,’ which blooms continuously throughout the summer. You can see she is a Painted Lady because of the four concentric circles, or “eyespots,” on the underside of her hindwing. 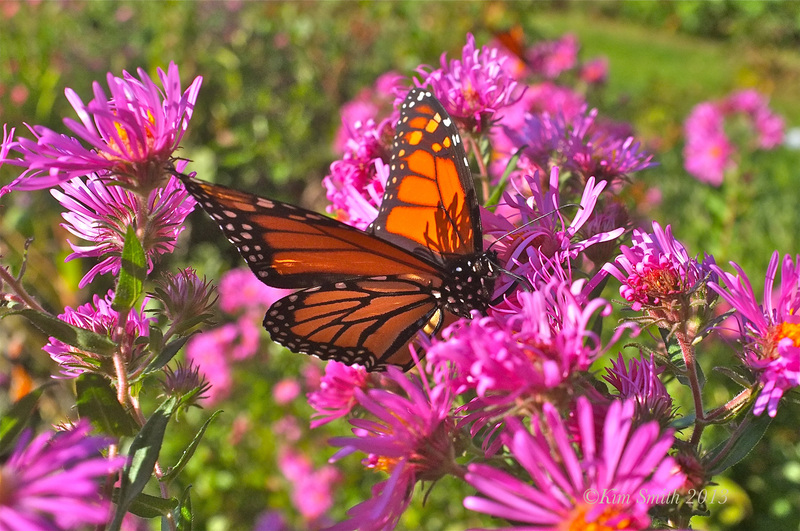 The second photo is of a Monarch nectaring at New England Aster ‘Alma Potchke,’ taken at a friend’s garden on Eastern Point. Our native New England asters have a wonderful spicy sweet earthy fragrance and are one the most potently fragrant asters found. New England asters bloom typically from late August through September. 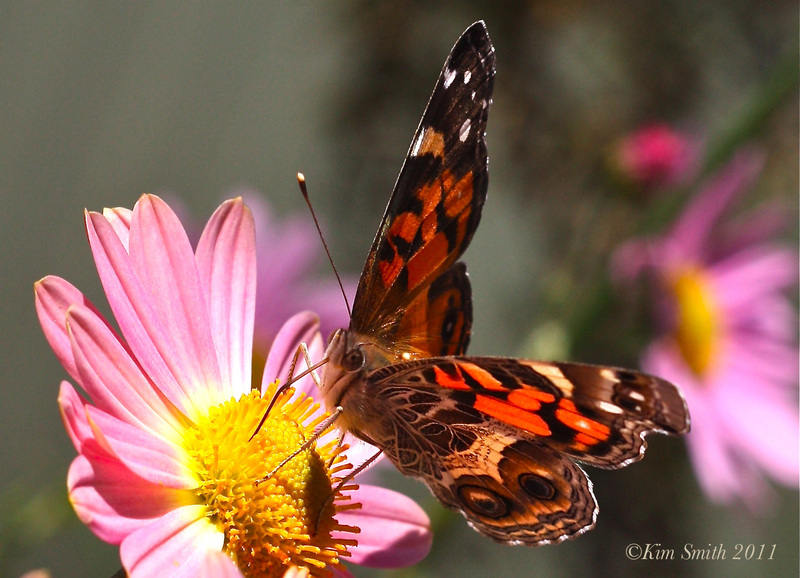 The third photo I’ve posted before and it is of an American Lady nectaring at Korean Daisies. You can tell she is an American Lady by her two comparatively larger eyespots. Unlike hybridized chrysanthemums, which are usually bred for color, Korean Daisies are the straight species and are fabulously fragrant. Their period of florescence is from September through October, oftentimes into early November; only a hard frost stops their bloom power. With just these three beauties, one could have a staggered and continuously fragrant garden in bloom from July through November–and create Mecca for butterflies on the wing. This entry was posted in Cape Ann, Fujifilm x100, Gloucester, Home and Garden, Lepidoptera ~ Butterflies, Skippers, and Moths, The Fragrant Garden, Wildflowers and tagged American Lady Butterfly, Aster novae-angliae, Buddleia davidii, Butterfly bush ‘Nanho Purple’, Chrysanthemum ‘ Single Apricot Korean’, compare American Lady Butterfly to Painted Lady Butterfly, Korean daisy, New England Aster Alma Potchke, Painted Lady Butterfly, Vanessa cardui, Vanessa virginiensis on February 25, 2013 by Kim Smith. 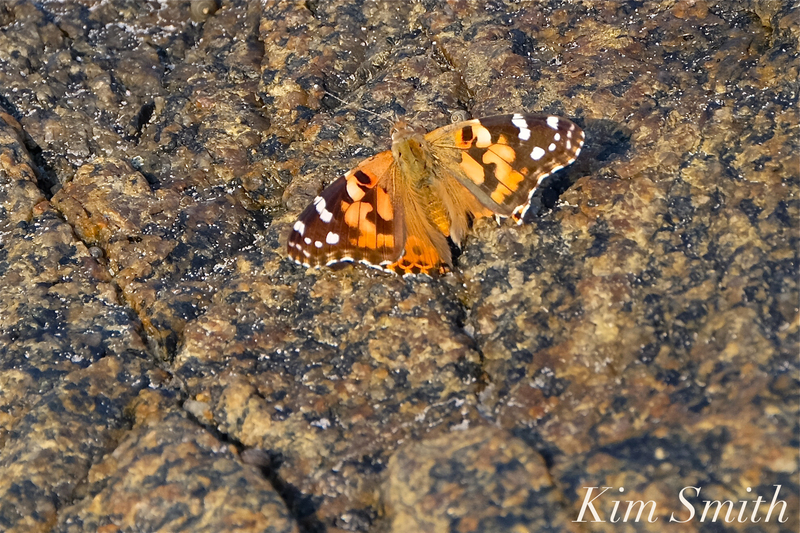 Painted Lady or American Lady? American Lady (Vanessa virginiensis) ~ Note the two large eyespots on the underside of the hindwing, close to the outer margin. Marty your photo is that of the Painted Lady. 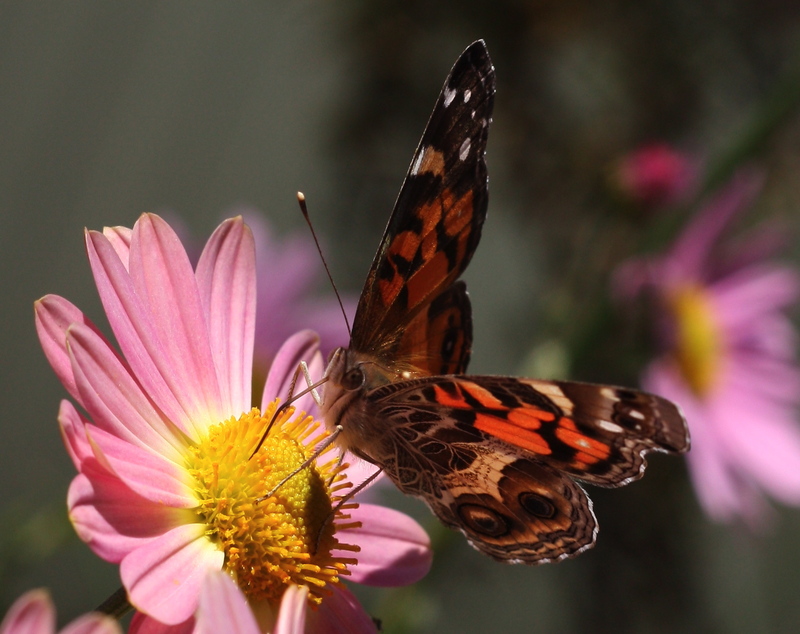 Typically in our region we would most often see the American Lady however, this is an irruptive year for the Painted Lady. 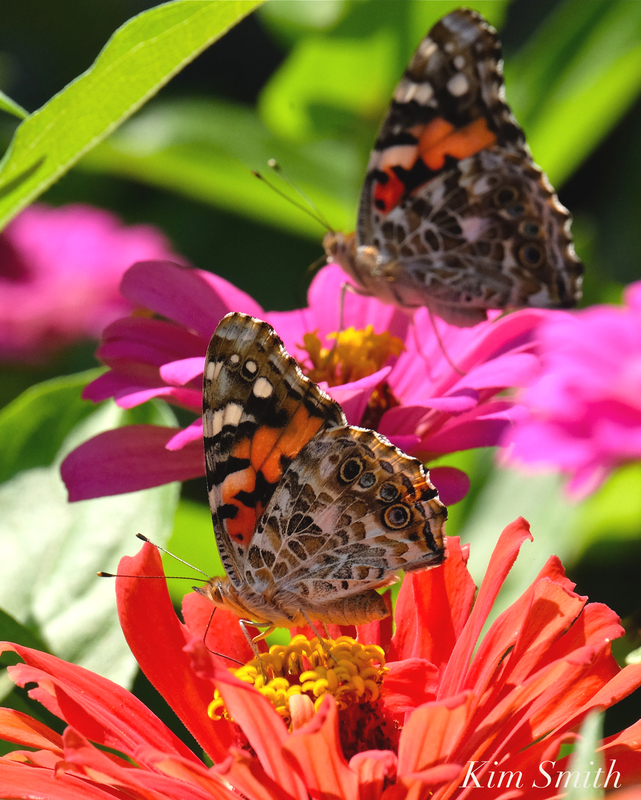 There has been a population explosion of Painted Ladies reported throughout New England and beyond, which is especially unusual and interesting because this past spring (2012) was also an irruptive year for the closely related Red Admiral (Vanessa atalanta). 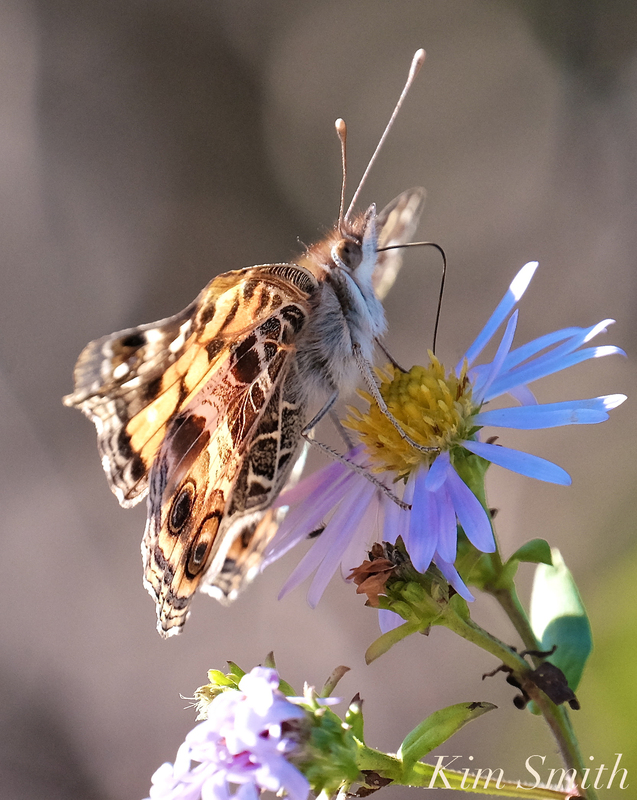 The easiest way to tell the difference: Painted Ladies have four large spots on the underside of their hindwings, close to the outer margins, which you can easily see in your lovely photo. American Ladies have two “eyespots” on each hindwing, and the spots are considerably larger. Painted Lady (Vanessa cardui) ~ Note the four prominent spots on the hindwing. I am calling the summer of 2012 the “summer of ten thousand butterflies.” Just incredible! I would have answered this is in the comment section, but I don’t know if it is possible to add a photo and will post more in a future post about the two species but am in the middle of making dinner. Did you take this shot with your new camera? This entry was posted in Home and Garden, Lepidoptera ~ Butterflies, Skippers, and Moths, Native Plants and tagged American Lady Butterfly, Painted Lady Butterfly, Vanessa atalanta, Vanessa cardui, Vanessa virginiensis on September 18, 2012 by Kim Smith. 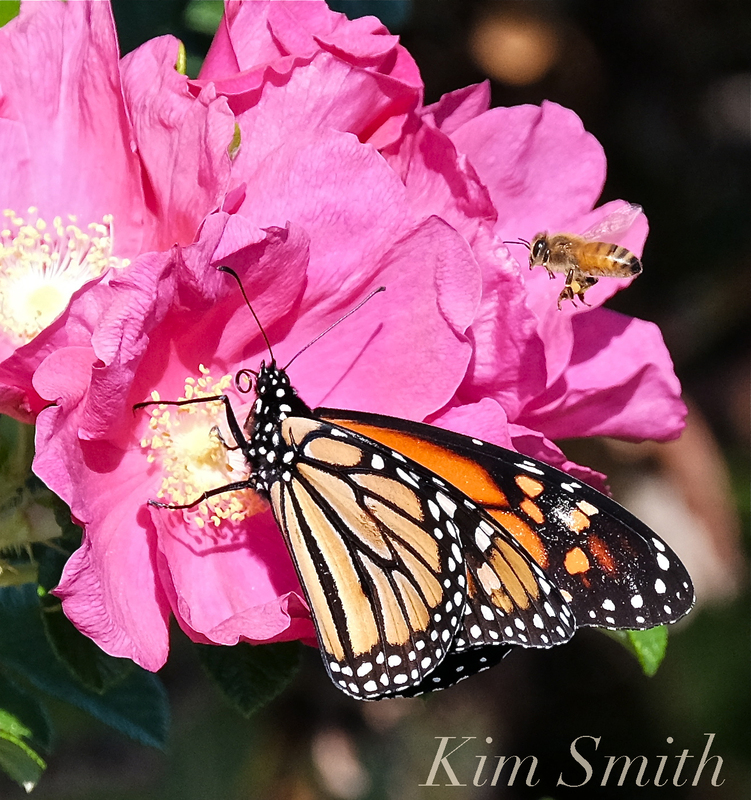 The most recent issue of Butterfly Gardener magazine features my photo on the back cover of an American Lady (Vanessa virginiensis) butterfly nectaring at Korean daisies. The North American Butterfly Association, or NABA as it is more commonly known, is a worthy organization to support. As a member of NABA four times a year you will receive two magazine subscriptions. I eagerly anticipate the arrival of both magazines. American Butterflies is edited by the world renowned lepidopterist Jeffrey Glassberg and is brimming with stories and species accounts of butterflies found throughout America. 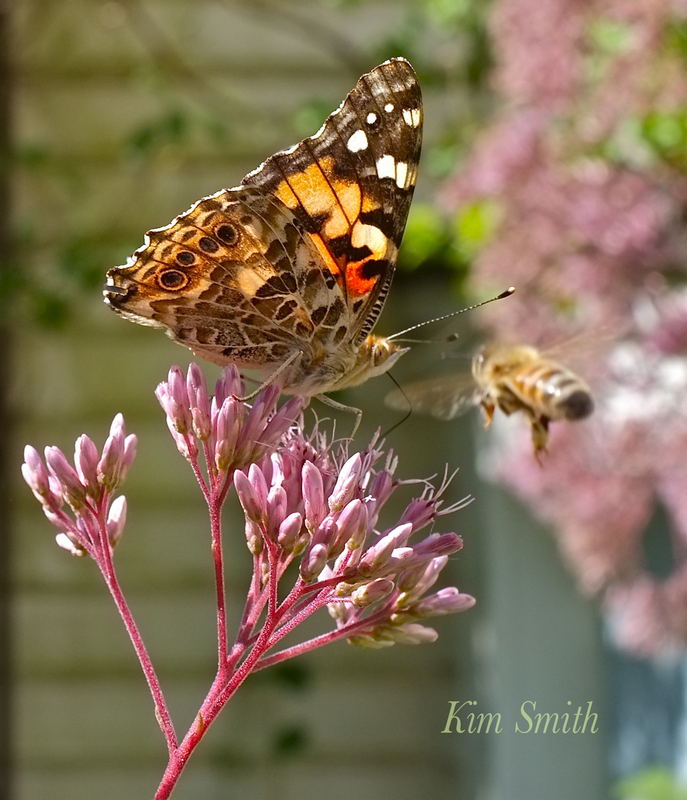 Butterfly Gardener, is chock-full of useful information about gardening for butterflies. I enjoy editor Karen Hillson’s missives and asides and find especially useful Lenora Larson’s quarterly column on caterpillar food plants. 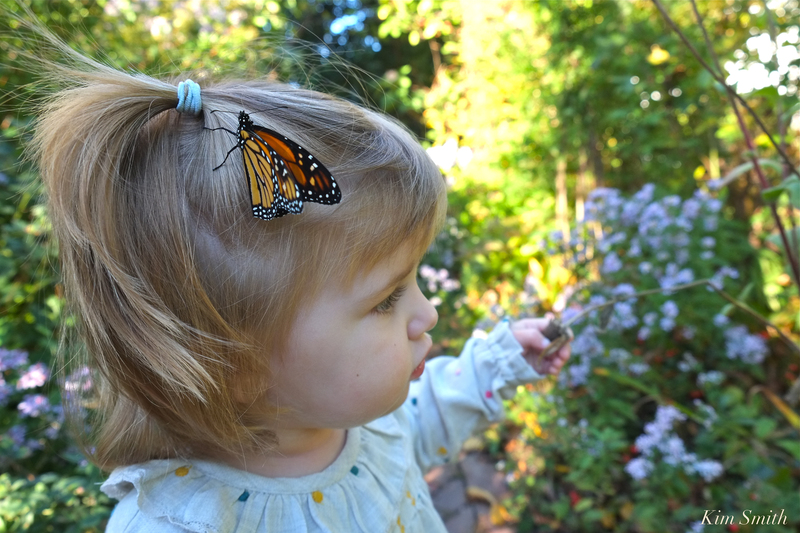 Mr.Glassberg writes in a recent issue of American Butterflies about why he believes butterflies are an ideal portal to the natural world “…once one becomes interested in butterflies, one almost certainly becomes interested in plants, in other components of nature–in the whole web of life. To find adult butterflies one must soon learn the important nectar plants in one’s area and especially the caterpillar foodplants. And the captivating transfomation of caterpillars into adult butterflies brings a very high percentage of butterfliers to a deeper appreciation of life histories and the larger ecological picture.” To learn more about NABA and how to become a member visit their website at www.naba.org (membership fees are very reasonable). This entry was posted in Antennae for Design, Cape Ann, Creating a Butterfly Garden, Gloucester, Home and Garden, Lepidoptera ~ Butterflies, Skippers, and Moths, Monarch Butterfly (Danaus plexippus), Monarch Butterfly Migration, Native Plants, Oh Garden of Fresh Possibilities!, The Fragrant Garden, Wildflowers and tagged American Butterflies, American Lady, American Lady Butterfly, Butterfly Gardener Magazine, Korean daisy, North American Butterfly Association, Vanessa virginiensis on September 20, 2010 by Kim Smith.